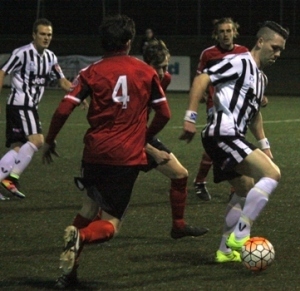 Hobart JEEP Zebras moved back to the top of the table with a 2-0 win over Clarence United at KGV on Friday night. The victory keeps the pressure on Devonport City and South Hobart, the other two clubs in the hunt for the PS4 NPL Tasmania premiership who both play on Saturday evening. Zebras started the sharper, with Luke Huigsloot and Adam McKeown linking up well on two occasions in the opening 15 minutes, however McKeown’s shots went just wide. On 25 minutes Luke Huigsloot had an opportunity himself from 12 yards, when he found himself in plenty of space. Unfortunately for Zebras, his turn and shot went just the wrong side of the far post. To their credit, in the first half Clarence fought strongly against their more fancied opponents. In the middle period of the opening stanza Clarence began to have continued possession and matched it with Zebras. Even with their possession Clarence couldn’t penetrate in the final third, with the Zebras defence able to prevent any clear-cut chances. The second half started 0-0 and it only took 4 minutes before Zebras hit the lead. Midfielder Jordan Muller played a sublime through-ball to Dwayne Walsh, who crossed from the right to find McKeown who tapped home from close range. As the second half progressed Zebras began to take hold and created further opportunities in the final third. In the 77th minute Huigsloot let fly from 35 yards with a shot straight at Clarence goalkeeper Matt Dyson. In a moment Dyson would want to forget, the ball went through his hands and into the back of the net to make the score 2-0. This moment demonstrated the often cruel life of a goalkeeper, as in the first half Dyson had pulled off an amazingly athletic save to keep his side in the contest. This horizontal diving save to his right to deny a cracking Muller volley was top class but was brought undone by his error here. The full time score was 2-0 to Zebras in a hard fought contest. Clarence kept fighting and made the hosts earn the 3 points, but they never looked to genuinely threaten at goal. Aaron Cairns had an up-and-down game in his first match returning for Zebras, getting through 60 minutes. Midfielder Michael Maiorano came off the bench in his return from a hamstring injury, but unfortunately for him he re-injured it and may miss another month of football. James Sherman and Jordan Muller were dominant in the middle of the park for Zebras, while for Clarence Nicholas Naden had flashes of brilliance but faded out as the second half progressed. Zebras coach Chris Hey was pleased with his sides performance, however can see areas to improve as they look to challenge for the title. “I thought all game we were dominant, to be honest with you, but I just thought we were turning balls over in silly circumstances. Whether it was too many touches, and then trying to force the ball when we didn’t necessary need to do that,” said Hey. “I thought the second half was a lot better, we kept possession a lot better. The flow of the play from us was quite good at times,” said Hey. Next week is a potential top of the table match as Zebras face Devonport, with the race for the NPL Tasmania premiership heating up. “Devonport (is) a game we have to win. there’s no use drawing, we have to try to get in front of them,” said Hey. Clarence United coach Alan Jablonski was impressed with the contest given by his side. “I thought it (the performance) was very workman like, and like I’ve said numerous times I’d like to be judged on continually improving through the season. We’re making it harder and harder for team to dominate games against us and I felt in the first half it was an even contest against two good football sides,” said Jablonski. Next week Zebras host Devonport at KGV on Saturday 4 June from 4pm, while Clarence travel to Warrior Park on Sunday 5 June to face Olympia in the Eastern Shore derby from 3pm.